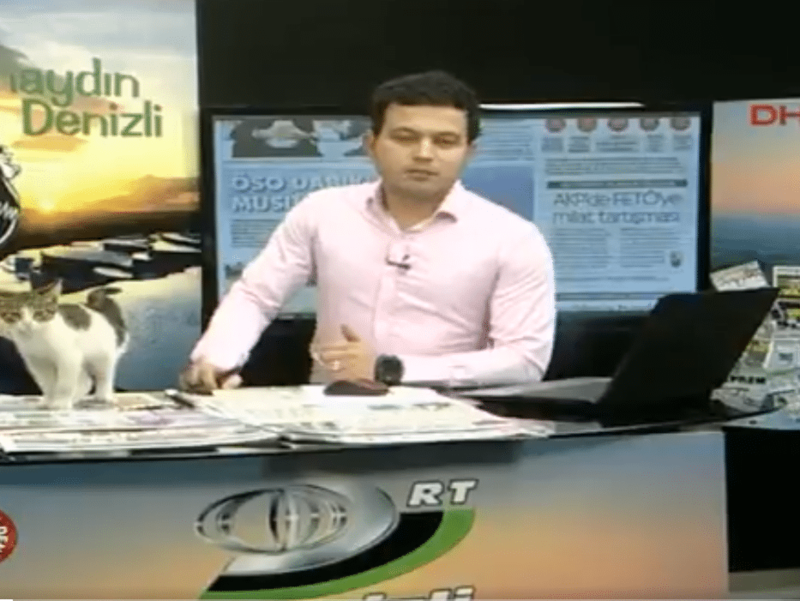 One cold morning in Turkey, television presenter Kudret Celebioglu was presenting the news as usual on his show “Good Morning Denizil.” Little did he know, as he was discussing the day’s headlines, a stray cat slipped into the studio through an open door. The cat walked through the studio, looking for a warm place to take a nap. And when he saw Celebioglu’s laptop, he decided that was the perfect place to go! 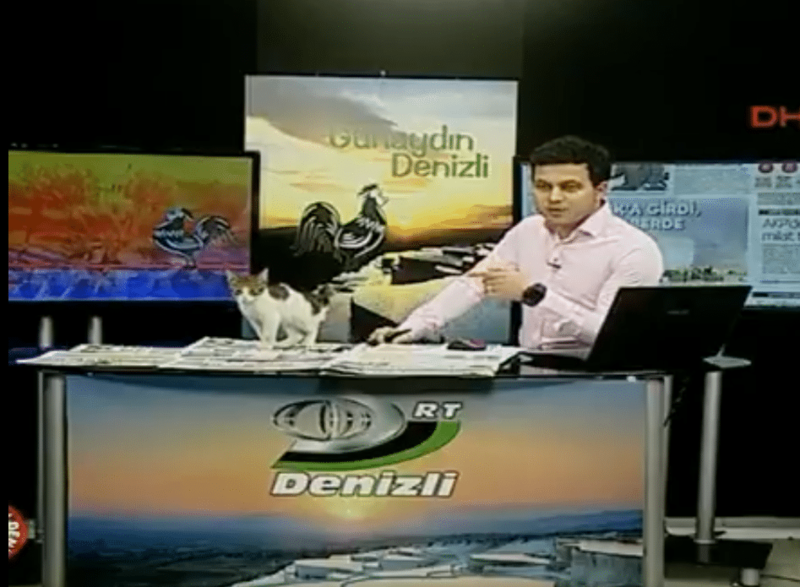 The cat hopped onto Celebioglu’s desk and looked at the camera—he seemed to realize he had become a co-presenter on a TV show! Then, the cat made a beeline for the warm laptop. 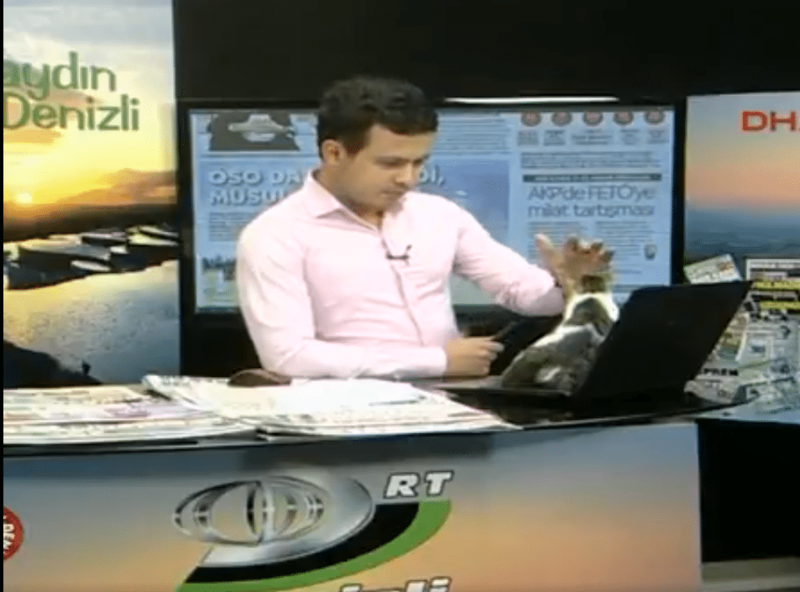 Amazingly, Celebioglu didn’t seem fazed at all by a cat joining his broadcast. He quickly changed gears and introduced the audience to the cat. “So let’s present to our audience…this cat, who’s jumped onto the table, as you can see,” he said. Celebioglu also talked about how people could to help stray cats stay warm in the cold weather. Kindhearted Celebioglu made the cat feel welcome, and he gave him plenty of pats of his head to show him he was in a safe place. The cat seemed happy to stay in the studio all day! 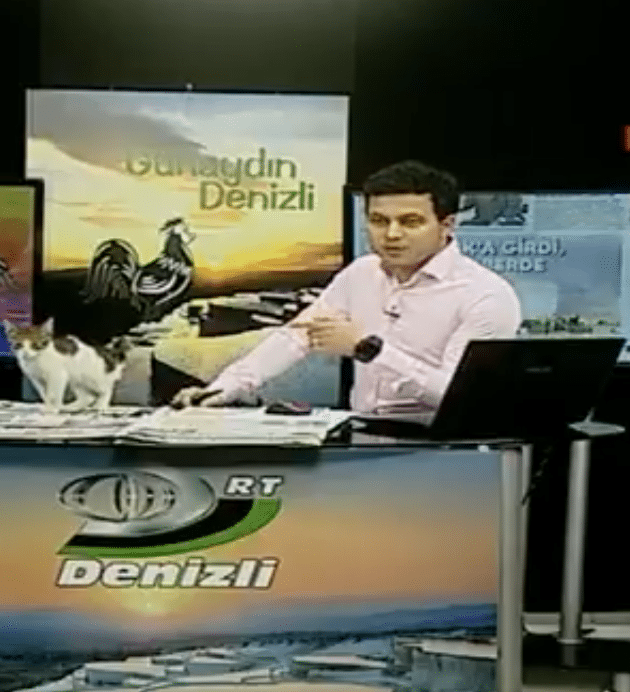 After the broadcast, the staff at “Good Morning Denizil” all played with the cat, and they gave him a name, Hüsnü. One of the TV station workers fell hard for the little cat, and he decided to adopt him that day. Just like that, this stray cat had a great forever home! 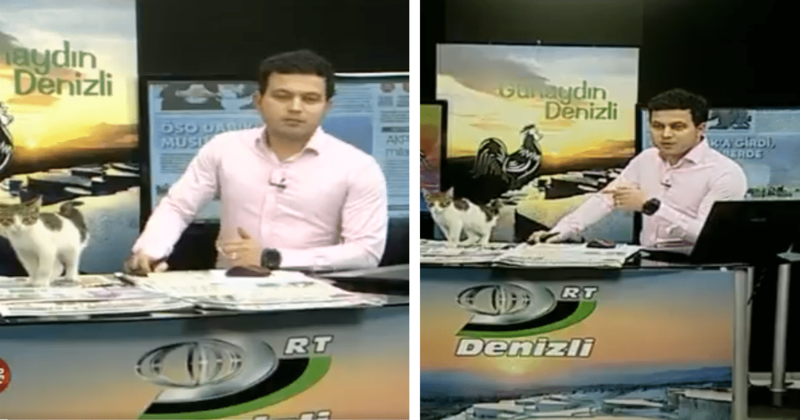 A clip of Celebioglu and his kitty co-presenter quickly went viral, first in Turkey, and then around the world. 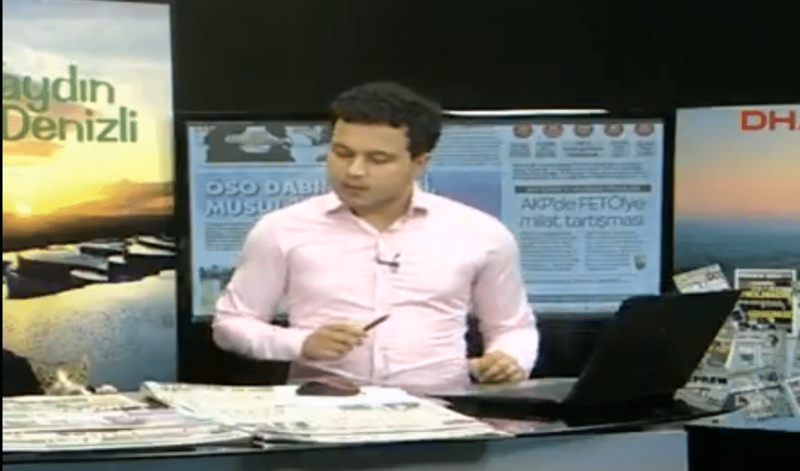 Everyone loved the way Celebioglu handled Hüsnü crashing his news broadcast. On YouTube, many people praised Celebioglu’s kind actions. Some YouTube commenters also imagined what was going through Hüsnü’s mind as he hopped onto the desk. Celebioglu had the perfect reaction to his unexpected guest, and we’re amazed by how he was able to improvise so quickly when this cat popped up. You never know what’s going to happen on live TV! If you’d like to see the adorable moment Hüsnü appeared on Celebioglu’s desk, check out the video below!